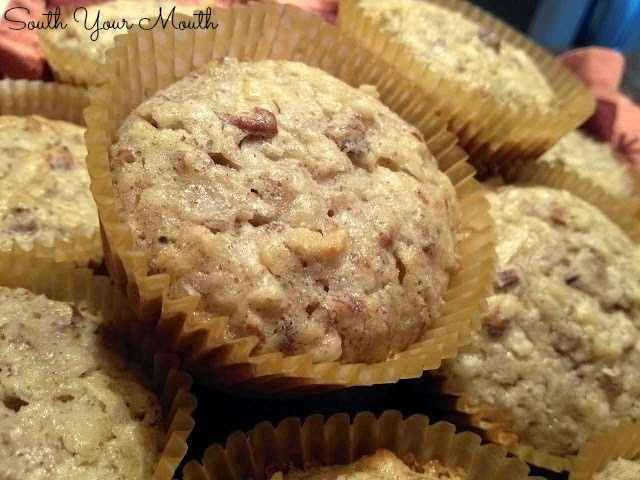 Banana, pecan, coconut muffins from a cake mix! So, I'm looking at these four overripe bananas today thinking that I NEED to make banana bread with them but I REALLY didn't feel like dragging out the flour, baking soda, etc. when I spied a box of Golden Butter cake mix. Then I spotted a bag of pecans.... and a bag of coconut.... and the wheels started turning. I threw together what I thought the cake mix would need to turn in to muffins and hoped for the best. The results? In a word? Amazeballs. Plus easy. And chunky. Also chewy. And moist. Add bananas, butter, eggs and vanilla to a large bowl or stand mixer and beat with an electric mixer on medium speed for one minute. Add milk, sugar and cinnamon and continue mixing for one additional minute. Add cake mix and beat until just combined. Fold in pecans and coconut. Line 2 muffin tins with 24 cupcake liners and divide batter evenly into each. Bake at 350 degrees for 20-25 or until toothpick inserted in the center comes out clean. HI THERE MANDY! your site is amazzing!!!! What could I subsitute for the cake mix? Amazing. Made them fresh this morning for a friend's birthday. All my co-workers were in love.